Over time, you can also lose the use of muscles in your hands due to arthritis hand pain. Arthritis gloves provide mild compression to help reduce pain, swelling and increase hand mobility. All arthritis gloves can help relieve arthritis hand pain by providing mild compression, but certain ones do more. Selecting the best arthritis glove depends on specific needs and costs. Not all arthritis gloves are the same. 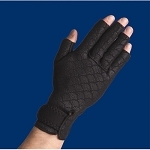 Types of arthritis gloves include open-finger-tip gloves, neoprene gloves, and specialty fabric gloves. Ask your doctor for glove recommendations for arthritis hand pain relief. Specialty arthritis gloves can alleviate joint pain in the hands, but you may still benefit from using regular cotton gloves. Arthritis patients use regular gloves immediately after applying medicated creams to their hands. 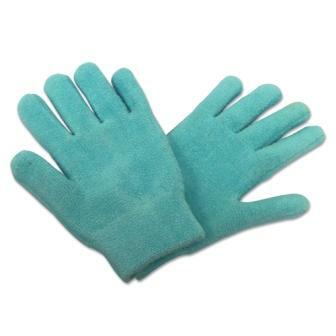 The gloves help the cream work more effectively without losing excess cream during everyday tasks. Consider using this technique before bedtime to benefit most from medicated creams. 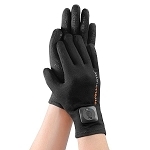 Gloves specifically designed to relieve arthritis pain in the fingers and hands. 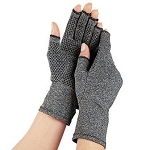 Provides warmth and comfort for arthritic hands. Helps with sufferers of Arthritis and Repetitive Strain Injury (RSI). Unique strapping systems aids in gripping.